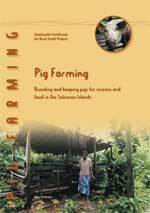 Pig Farming is a handbook for trainees in the Kastom Gaden Association Sustainable Livelihoods for Rural Youth Project. The project was funded by AusAID between 2002 and 2004 to assist rural youth in the Solomon Islands establish income-earning projects as part of post-conflict reconstruction. Pig Farming is a training module in the project.